Looking again at the chronological age versus the developmental age - this is n important subject and we'll look at why. 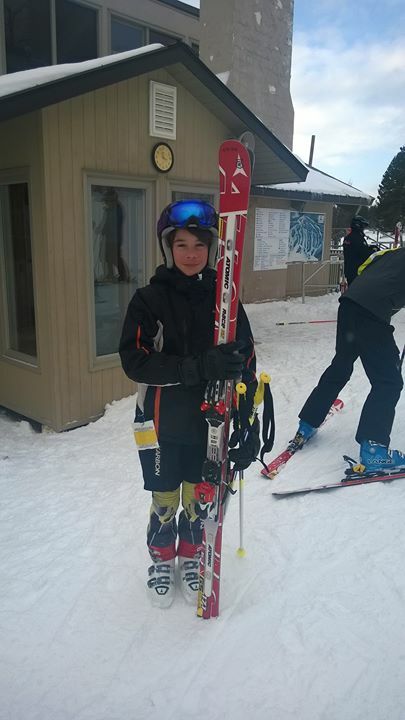 The issue is that at U12-U16, there are massive differences between the two, since kids simply develop at vastly different rates and this creates huge gaps and issues in sports where selection, racing and training is grouped based on age - ski racing being one of them. I think there's a lot of talk and rationalization on trying to develop a better development system for ski racers, but the age thing has been "in your face" for a long time and, if it wasn't seriously considered that an age bracket discrimination starting in the middle of the ski training season doesn't make any sense, not even since the book "Outliers" was published, that's on whoever we rely on making the serious considerations that matter! To be fair, the coaching manuals do point out the distinction between developmental age and chronological age, but that's all. The only mitigating factor at play here is that the age groups do include two full years, so a talent would likely show something by the second year in say U14... but still among all the other second year U14s... so hmm. It's not just chronological age differences but also skill, which may develop faster or slower! It's annoying to see a wide range of skills bundled together in the same "age-based training group". Everyone suffers: those that need more attention will not get it and those that need more specific and complex training, won't get it either - since the coach has to keep them both reasonable engaged! Ideally we'd have skill-based training groups, rather than age-based. That is to some extent, catered to by tiering the racing and many clubs having a "performance" training group, like a division 1 vs 2 or such (OCUP vs SOD CUP or some other politically correct name they conjured in other locales). I am sure however that there are better selection criteria. Not based on the results, but I think there are... and I don't think it's a "Moneyball" thing either, as this is not a team building optimization issue, however related but more subtle... how do "they" recognize who is an "emerging athlete"? Good question! Would this athlete continue to develop just as fast with different coaches? ...it seems everything gets reduced to this, at least that's all the article talks about: let's select some athletes somehow and give them some resources. On the other hand, this is sort of normal... when you have fewer resources, to worry about allocating them... but what if more attention to coach training would have more of an effect than "athlete selection" ? What if this was the one resource that mattered, in the long run: better technical coaching at the lower ages? I remember Mikaela S (or her mom) saying in one of the interviews something along the lines of her being lucky to have had an early coach that insisted on good fundamentals... why is that considered "lucky" ? I would have thought that by now it would be obvious that since we recognize we need to develop better technical skiers the essential ingredient would be... well, technique. But that seems to be far from the case. I do not see our coach education improve, on the whole! Viewed 78 times ( | Print ) this page.